April | 2008 | It's About Bunnies! An F.U.N. video with music from Spongebob Squarepants. I first found out about it when someone posted it on The Fuselage site in Jorge Garcia’s section. Love it! Last night’s episode….. stunning! I could barely breathe during the last ten minutes, clutching tenatiously to one of the couch pillows. Where is this going? Every time that I think I figure something out, Darlton come over with the ice cream scoop and extract my brain. So many things to chew on, such as…. What did that little smile mean after Ben talked to Sayid in Iraq? Was it “Yeah! One for our side” or “BWWAAAH HA HA.. Tricked you, sucker”? How about Ben getting the same “You’re the killer” treatment he gave Michael and Ana Lucia, from Widmore? Who is the real “murderer” of Alex? What are the rules of the game and how will the change (i.e. Alex’s death) affect it? Is Ben’s little black stick a twisted reference to the “rod of iron” (first seen pummeling Sawyer in Season 3) in the Bible? An antithesis to Mr. Eko’s stick (dark/light)? Or is his taser in the shop? Roger: “Now, calm down, Bengeemon, and go get me that cleaver and a beer. You outta be grateful. Not only are we going to have a good supper tonight, looks like your ol’ man’s gonna finally be able to “customize” his Dharma work ride a little”. Just one more daddy issue to add to the list. It’s about bunnies…indeed. 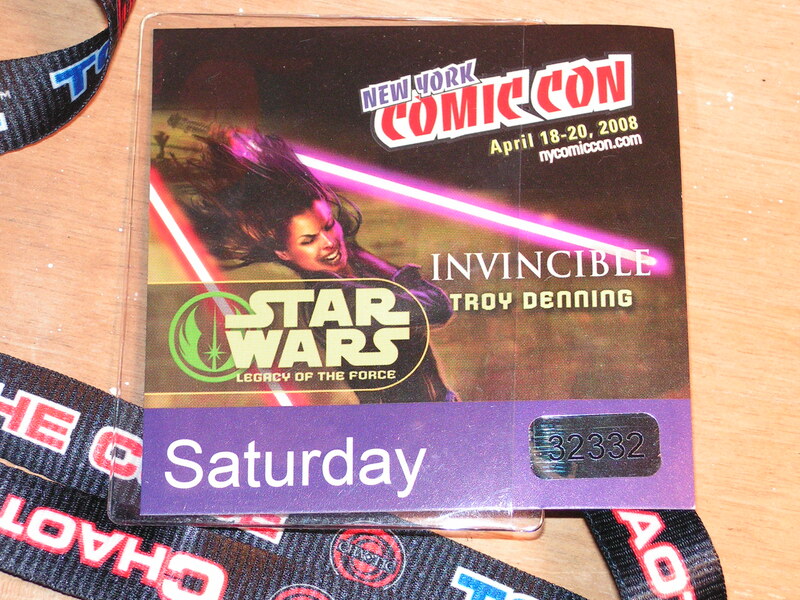 I went to Comic Con this past Saturday. I am still hurting from all the walking we did. But it was fun and tried to see as much as I could while I was there. And there was ALOT to see. But one thing I did NOT see was LOST merchandise. I was so excited to get something; a tshirt, a keychain, an empty container of Dharma Ranch Dressing… ANYTHING! . 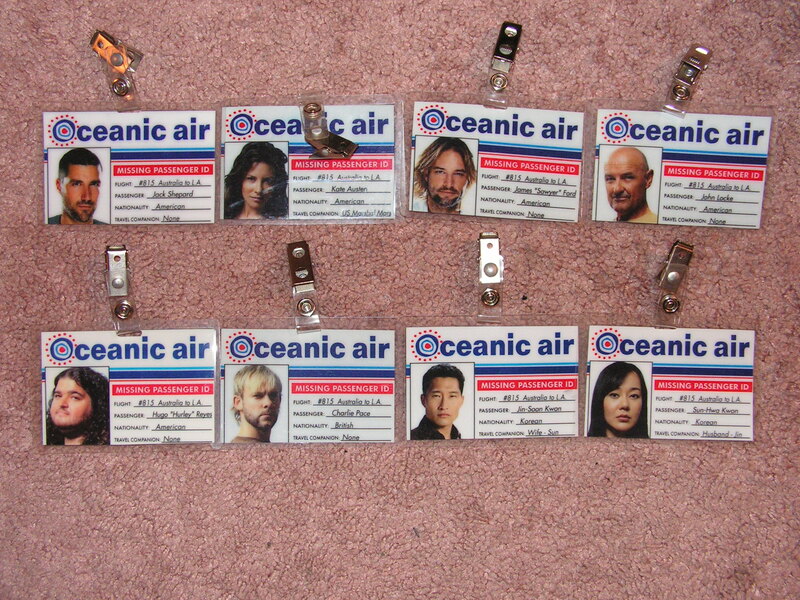 My hubby went to the Big Apple Con last year and got me these cool Oceanic badges. So surely, at one of the largest comic, sci fi and pop culture events in the WORLD , there HAS to be LOST stuff, right?! NUTHIN!! Big ol’ goose egg. No wait, correction. I was able to participate in a free raffle to try and win some LOST goodies at the Ubisoft booth (one t shirt with the numbers, some soundtracks and three figurines) Sad to say….didn’t win. Even tried to pay for a Sawyer doll, sorry, action figure. Shut out… denied. Otherwise, had a terrific time. I would go again in a heartbeat. This is one of the first LOST parody songs that I wrote. It is about the devious yet congenial Benjamin Linus. It is a parody of “Betty Davis Eyes” , a number one eighties jam by the smoky throated Kim Carnes. (Most of my parodies are retro, for I am of a certain age). I would like to stress that I think Michael Emerson has been a crazy awesome addition to LOST. And the ONLY reason that I felt free to write a song like this is that “Bug Eye” is part of the canon of the show (And …it is kinda funny, in a “Sawyer” sort of way). Hello and welcome to “It’s About Bunnies”. In the fine LOST tradition of Mr. Eko, Miss. Klugh and Mr. Clean, I shall go by the somewhat formal yet mysterious moniker, Ms. Wendy. (I would have went with Mrs. Wendy, since I am one, but it just reminds me too much of Mrs. Butterworth. So, I decided to go this route). This, obviously, is my first post so I will try to explain the reason for my blogging. In September of 2004, I met my latest obsession. And to be honest, it was truly an unexpected one. 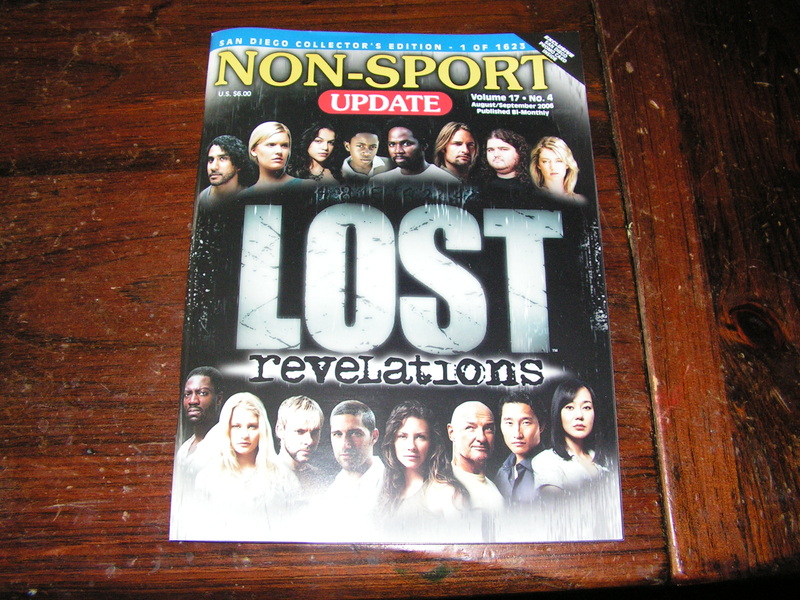 When I saw the preview for LOST, I thought “You’ve GOT to be kidding me”. Impossibly beautiful people yet again in some sort of peril . This time … a plane crash. Pretty people running from moment to moment of inpending danger, occasionally stopping to wash their pretty self in the ocean wearing only, of course, their undies (Kudos to ABC though for FINALLY showing that sometimes we ladies don’t always match our unmentionables ). But I decided to give it a try anyway. If it stinks, it’s off. But if it was the mythology that grabbed me, it was the character development that has kept me. I LOVE these characters. The writers and actors made me care about what happens (and has happened ) to them. LOST is that great book you never want to stop reading. So, why “It’s About Bunnies”? In the Season One episode “Confidence Man” , Sawyer utters these words speaking about the first of his many reads on the island, “Watership Down”. To make something so complex so very simple. And that is what I have to be reminded of when the theories get me bogged down. When I get a little too obsessive about LOST. That I just need to step back and chill out. It’s just a television show. Enjoy it for what it is. Of course, I don’t DO it! But it’s good to set goals for yourself. So this blog is going to be mostly about my co-dependence… I mean fondness of all that is LOST. Big stuff, little stuff, stuff that just doesn’t make any sense at all. And I have also written several LOST parodies (some recorded, others in various stages of “finished”). As soon as I figure out how to get them attached, I’ll put them on here too. P.S. Eight more days til LOST. 8….hmmm. I wonder what THAT means?